Montanha: e depois de jantar nas Galeries Royales Saint-Hubert ... uma bela de uma "jola"
e depois de jantar nas Galeries Royales Saint-Hubert ... uma bela de uma "jola"
We need to go back in time for 80 years to explore the origin of this unusual name. About 1910 Mr. THEOPHILE VOSSEN ran an establishment called "LA COUR ROYALE". Amongst his many customers were a lot of employees working at the National Bank of Belgium. Those employees passed their time in the pub playing a dives game called "421". Before returning to the office , the employees played a quick last game and the one who lost was called the: "MORT SUBITE" or the sudden death. 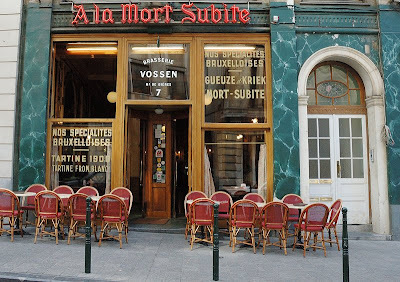 Very soon this name became well known and when THEOPHILE VOSSEN moved to this actual address in 1928 he decided to call his pub: "AT THE MORT SUBITE". The same name as this own beers. His sons and grandsons René and Jean-Pierre VOSSEN continued the tradition for more than 36 years. Today, the fourth generation of the VOSSEN family Olivier and Bernard, continuous to serve you these delicious Gueuze beers in the same establishment which also retains the original 1928 decor.